This is from an environmental tapelift in a home impacted by smoke from a forest fire. These pyrolized phytoliths are still within the ashed cell walls of the plant that created them. Phytoliths are mineral deposits formed by plant tissue. They may be hydrated silicon dioxide (opal), calcium oxalate monohydrate calcium oxalate dihydrate, calcium phosphate, or calcium carbonate. These structures have distinctive shapes and often can help identify the plant of origin when found free in an environmental sample. They are very common airborne particles in arid environments and were identified in the dust captured on the sails of the HMS Beagle in 1833, as reported by Charles Darwin. The calcium oxalate phytoliths from cacti contribute to the calcareous aerosols of the Southwest United States. The characterization of phytoliths and the identification of their plant of origin is progressing as a result of their value in determining ancient environments from soil samples. They have also been used to identify the beginnings of agriculture at archeological sites. These studies all fall under the general discipline of Palaeobotany. In palaeobotany the term is generally limited to the silicon dioxide type of phytolith because they are the most persistent in the environment. These particles are left behind when plant materials degrade or are burned. The siliceous phytoliths typically become amorphous, transparent particles of distinctive shape. When burned they often become coated with a layer of carbon and appear black or gray. 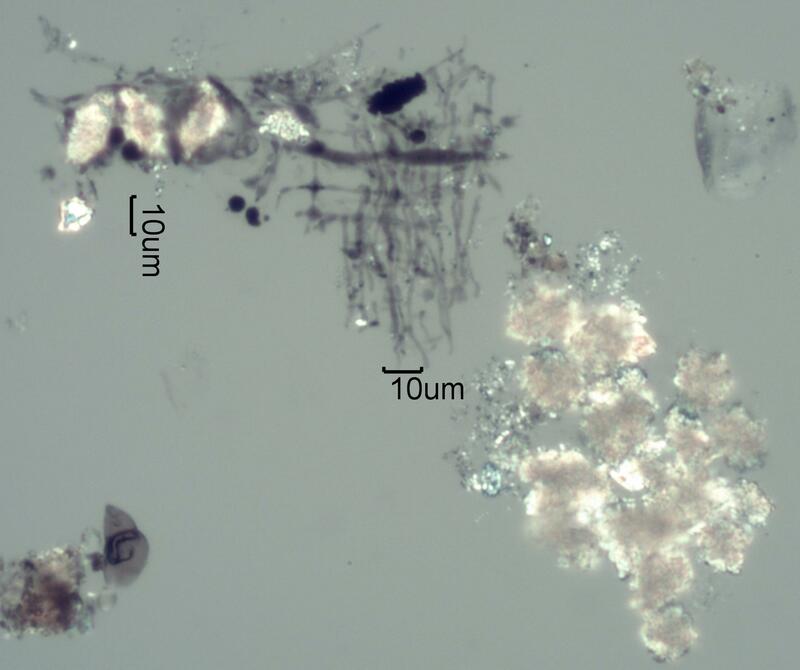 Calcareous phytoliths may remain intact as the plant degrades. When the plant containing calcium oxalate phytoliths is burned the phytoliths go through a series of chemical reactions. First they begin to loose the waters of hydration. That begins at about 120 degrees Celsius. Next, carbon monoxide is released and calcium carbonate begins to form on the surface of the crystal. That begins at a temperature of about 420 degrees Celsius. At this point the crystal generally still maintains its original shape. The crystal shows the effect of the exposure to heat but the shape is still consistent with that characteristic of the original plant. Continued heating ultimately result in the formation of a calcium oxide, begining at about 620 Celsius. Cubical calcium oxide and hydroxide particles are common in the plume from the combustion of wood, often showing surface modification to the carbonate. The surface modification is evident as a birefringent film over part of the particle. The silica phytoliths are characterized by their low refractive index, less than 1.48, their cell related morphology (see Madella, Alexandre, and Ball; 2005), and by their lack of birefringence. The other phytoliths are dominated by their crystalline structure rather than cell morphology. The crystalline habit manifested by these phytoliths will vary from plant species to plant species and from cell type to cell type within a species. The two types of calcium oxalate phytoliths from the leaves of Rhubarb are an example of variation between cell types in a single species. 2. Franceschi, Vincent R. and Harry T. Horner Jr., "Calcium oxalate crystals in plants", THE BOTANICAL REVIEW, vol. 46, No. 4, Oct-Dec 1980, pp. 361-427. 3. Piperno, Dolores R., PHYTOLITHS, AltaMira Press, 2006. 4. Rapp, George Jr. and Susan C. Mulholland (eds), PHYTOLITH SYSTEMATICS, Plenum Press, 1992.